To purchase any available piece or to ask a question click the link and send me an email noting the design name in email subject line. I am pleased (and proud) to say in all these years it's never happened. But if by chance you're (GASP!) not pleased, for whatever reason, with any purchase from my studio I want to do EVERYTHING in my power to see that you become pleased! Every purchase is fully guaranteed via an exchange for a new piece that is available on the website, or a full refund (minus shipping costs) upon the items return in original condition. Please contact me to arrange the option that will work best for you! 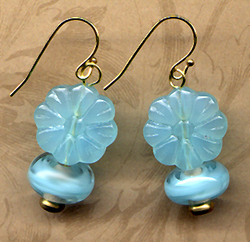 *Remember many of these items are created with ART GLASS BEADS which while fully annealed do yet require gentle wear and care (and/or small beads,parts, pearls,gemstones)and are NOT for children. To purchase a piece shown, or to join the studio mailing list to be alerted when new work is added to the website email me at glasschick@yahoo.com Please note earring name or item number in subject line. To join 'new work notify' note 'join mailing list' in the subject line. Ah life in general - may as well laugh, eh? 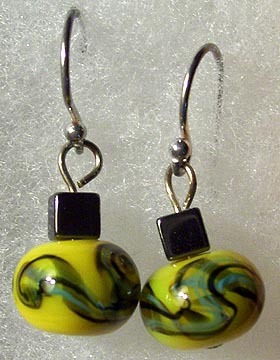 As seen, one of a kind - my lampwork beads, sterling silver wires. NOT FOR USE BY CHILDREN OF ANY AGE! Pale Pink Winter Blooms! 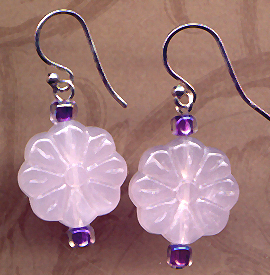 SUMMER MAY FADE but these earrings whisper SPRING! 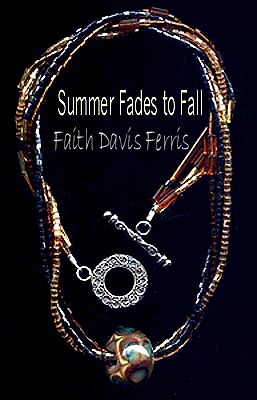 $2.50 shipping in US (sales tax also for NYS residents) International shipping is $5.00 US funds. A set of my lampwork beads that I embellished with hand created latticino. 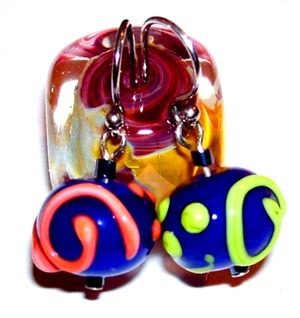 The latts swirl around the lampwork beads like fall winds! I offset the round shape and intense fall leaf yellow of the beads with sedate, calming, square hematine beads - all findings are sterling - wires and hooks. Aprox 1 inch long top of hook to bottom of bead. To purchase email me at glasschick@yahoo.com and note crisp fall yellows or item 127 in the subject line - as always first email request will receive the offering!